We invite you to the open house at the Malibu Condominiums this weekend, where you can find out about some amazing promotions that will be offering! Get to know the innovative interior design of the lobby developed by AG Designs! For a limited time only, save up to 20% off designer wallpaper at A.G. Designs by Caducus Folium. For the Honduras location and contact information, please visit agdesignshn.com. Fabrics, Fabrics and MORE fabrics.... Come and enjoy a 20% discount on the fabric that perfects your style for curtains, outdoor, sofas, bedding, and much more of our exclusive brands .... 23 -27 September! See you there! As our Nicaragua Design Center awaits new inventory, enjoy our rug liquidation sale with designer rugs under $200! Nicaragua Design Center honors mothers with 20% off for Dia de las Madres. 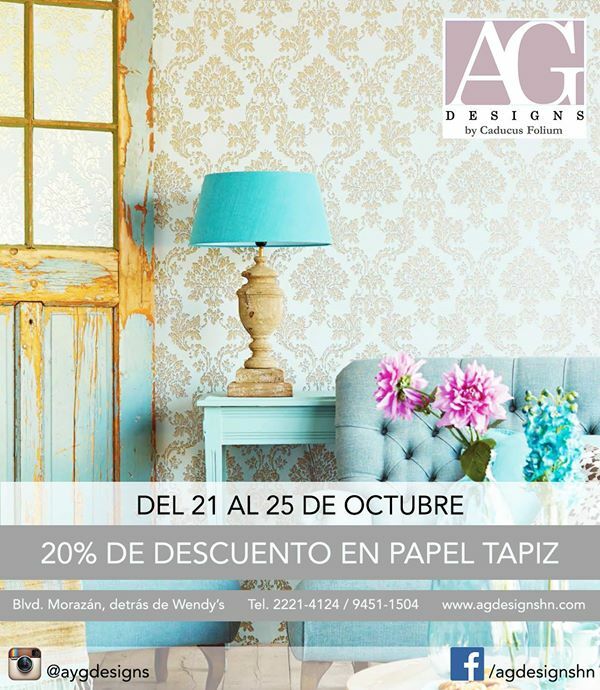 During the month of May, visit our Caducus Folium+ Design Center in Nicaragua to receive 20% off all fabrics!